After months of planning and preparations by CNMI Watershed Group agencies, tree planting is underway in the badlands of the Lao Lao Watershed. Following on-site instructions from Vic Guerrero of DLNR Forestry, over 60 volunteers planted 125 saplings and 250 cuttings high on the hills above Lao Lao Bay last Sunday, July 16. The trees were planted in an area that had been burned, possibly by hunters illegally setting fires. When forest is removed from the land, whether by fire or other methods, soil erosion frequently results. This erosion causes soil depletion from land where it is needed, and sedimentation of streams and coastal waters, leading to algae blooms and loss of corals. In fact, the primary purpose of the Lao Lao revegetation project is to reduce sedimentation and subsequent coral loss at the Lao Lao dive site. Sunday's volunteer planting effort was led by Beautify CNMI, in collaboration with Watershed Group agencies. 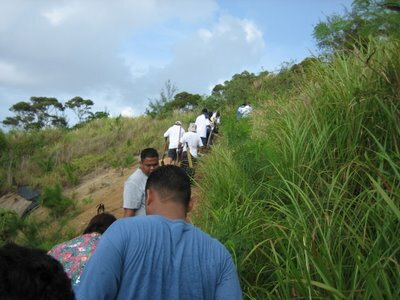 Participants included the Filipino group MOVER; Beautify CNMI members, including organizers Rep. Cinta Kaipat and Angelo Villagomez of Marianas Resource Conservation & Development Council; teachers and students from Hopwood Junior High School; community volunteers; and agency personnel from the Dept. of Lands and Natural Resources Forestry Division, Division of Environmental Quality, and Coastal Resources Management Office. 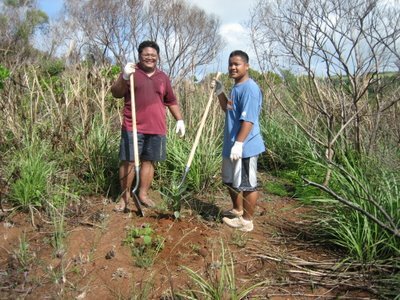 According to Kaipat, one of the Forestry staff members was quite amazed with the teamwork shown by the Beautify CNMI volunteers. "He stated that the Laulau tree-planting effort, which resulted in the planting of over 300 trees that morning, made their jobs so much easier," she said. 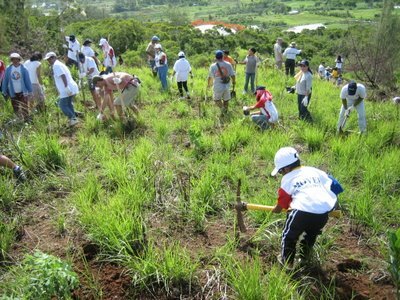 "It was fun and it felt great to do something good to protect our environment and help beautify it. I was thrilled to see more new faces and was especially glad to see more young volunteers. Thanks to all the Beautify CNMI partners for another successful tree-planting effort." 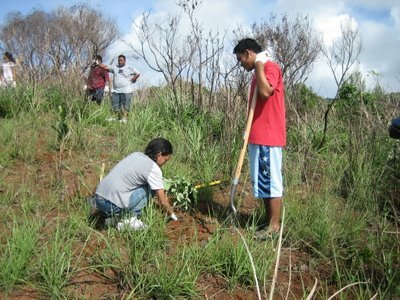 Villagomez said the revegetation project "fits perfectly" into the Beautify CNMI's mission. "Not only will these native trees provide habitat and food for our native wildlife, they will also slow the erosion of the hillside into the bay. This will ultimately improve the health of the coral reef, which will in turn improve the diving for the tourists and the fishing for the locals," he said. Following a revegetation plan prepared by the Natural Resources Conservation Service and DLNR Forestry, six species of tree saplings were planted: Sosugi (Acacia Confusa), Kamachili (Pithecolobium dulce), Banalo (Thespesia populnea), Gaogao flores (Erythrina sp. ), Daok (Calophyllum inophyllum), and Madras cacao (Gliricidia sepium). These species were chosen for their ability to tolerate the harsh conditions of the badlands and, in some cases, for their nitrogen fixing properties. Pago (Hibiscus tiliaceus) cuttings were also planted. Once grown, these fire resistant trees are intended to serve as breaks should a fire occur in the future. However, the best defense against fires is to prevent them from starting, and all involved agencies encourage the public to report illegal burning activities to the Department of Public Safety at 664-9000, or 911. Tree saplings for the project are being propagated at the DLNR nursery in Kagman. Forestry has already prepared more than 600 saplings for the Lao Lao revegetation project, in addition to the hundreds of other saplings they prepare for planting projects throughout the island. Fiesta Resort is also donating saplings for the project. Through grant awards from the National Oceanic & Atmospheric Administration, CRM has provided materials and supplies for an expansion of the nursery, propagation of saplings, and planting activities. DEQ is also contributing materials and supplies for propagation and planting through a grant administered by the U.S. Coral Reef Task Force. Overall planning, funding and coordination for the Lao Lao Watershed Restoration project have been conducted through the CNMI Watershed Group, which includes representatives from all of the aforementioned local agencies. 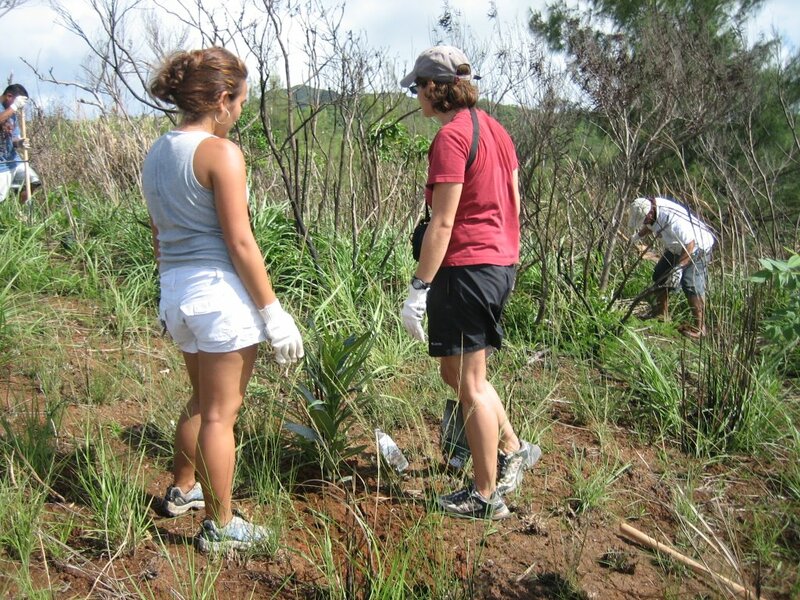 Volunteer planting activities at Lao Lao will continue on weekends for another two to six weeks. 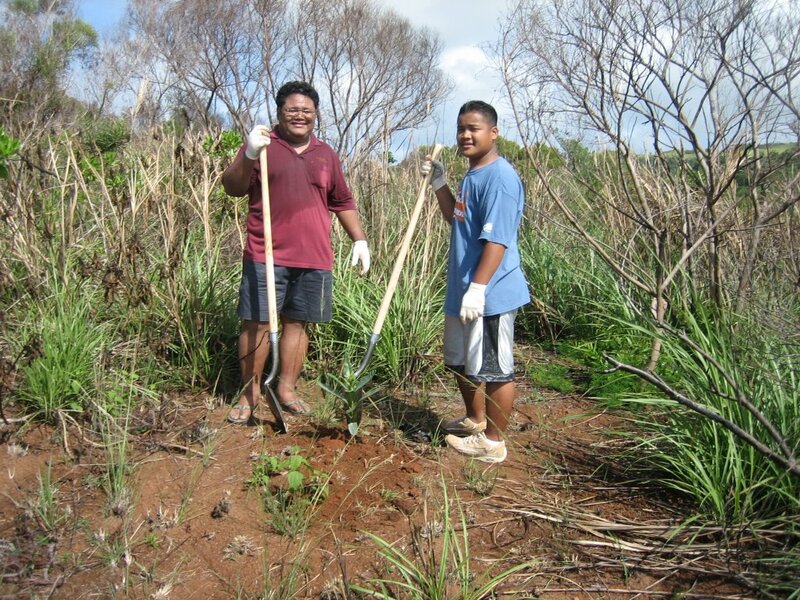 If you are interested in joining Beautify CNMI and/or the Lao Lao revegetation effort, contact Angelo Villagomez, RC&D Public Involvement Coordinator, at 236-0894, or Tim Lang, CRM NPS Manager, at 664-8322. Hiking up to the revegetation site. 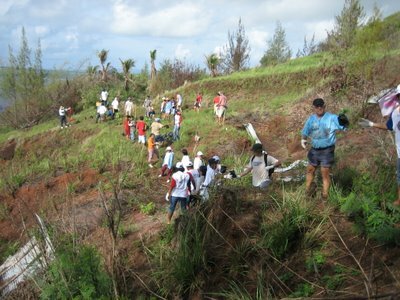 Volunteers forming a human chain to pass the trees up the hillside. Vic Guerrero of CNMI Forestry explains the six different tree species we planted. Gus and Kyle Kaipat pose for the camera. PSS teachers Diana Felix and Bree Reynolds inspect their work. 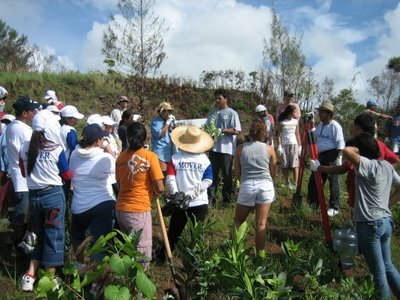 Volunteers spread out to plant the trees. 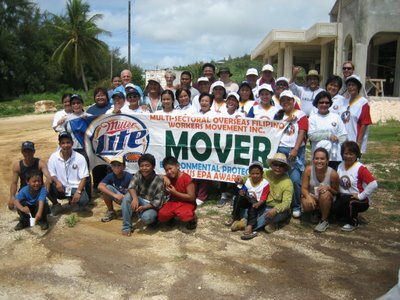 Posing with the MOVER volunteers.